I think now is as appropriate of a time as any to tie together two topics I’ve written about extensively on this blog: anti-social media and cryptocurrencies. It’s hard to ignore the financial news from yesterday: cryptocurrencies with another double-digit percentage drop, stock markets dropping about 5%, volatility up 100%. It is probably the top requirement to make interpersonal relationships last. 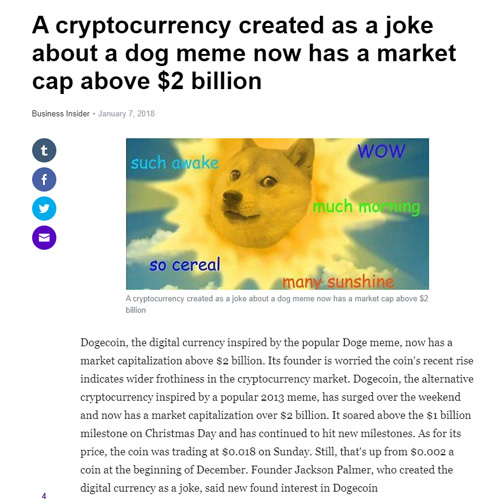 An Internet meme’s lifespan is usually pretty short before its comedic effect wears off, but somehow this five-year old joke has made a comeback because of the cryptocurrency surrounding the meme.